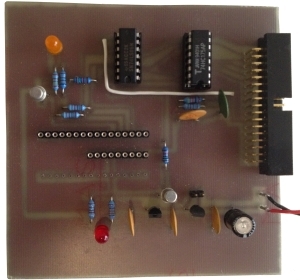 This page describes the PIC Programmer that Bill Brendling demonstrated at Memofest 2013. 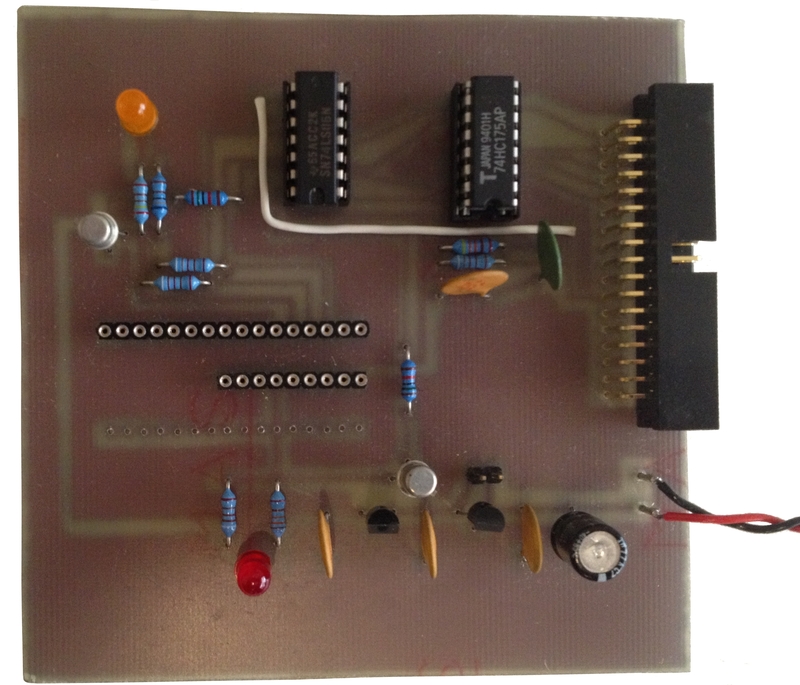 Bill created this in the 1990s to help with his other electronic projects, giving him the ability to program PIC devices using his MTX via the parallel port. Bill produced his own PCB for the design, there are a number of ways of doing this for the hobbyist, just Google "pcb diy" for more information. 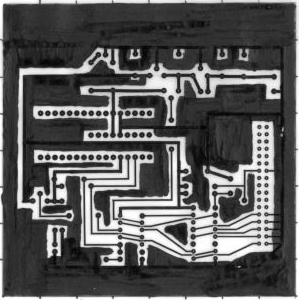 Briefly, one way of making a home-brew PCB starts with a board that is completely copper clad, the track layout is "printed" onto the copper board and forms a protective layer over the copper that is to become the tracks. An etching solution, such as ferric chloride, is then used to strip off the exposed areas of copper, leaving the tracks in place, before finally, the holes are drilled by hand. 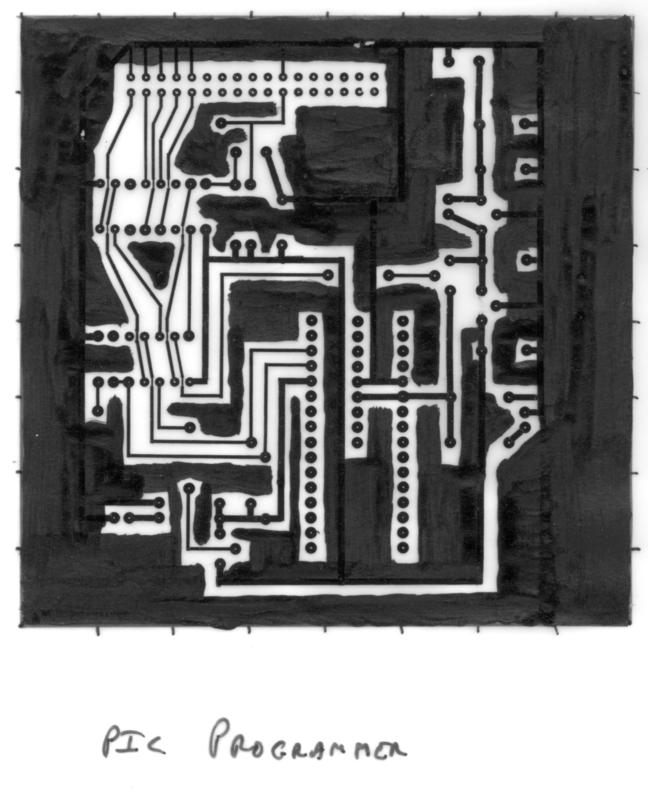 Describing how the original PCB was produced, Bill recalls that "the layout for the PCB was done with transfers and was photo-etched. 1. It saves on Ferric Chloride during the etching. 2. 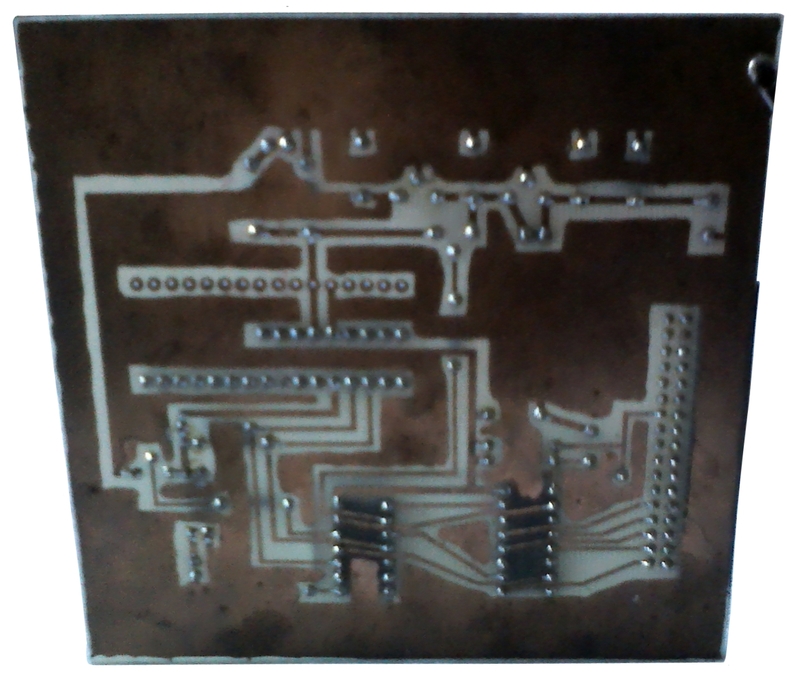 It often gives better results, While trying to etch away large areas of copper, the edges of all the tracks are also being attacked, and narrow tracks, such as between IC pins, can be etched right through. 3. Having a large ground plane does not hurt anyway. " 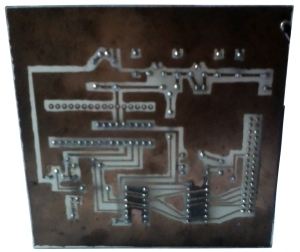 The base board is fibreglass and is translucent, holding the board up to the light, the areas where the copper has be removed can be clearly seen. Bill has provided some notes on the original design . 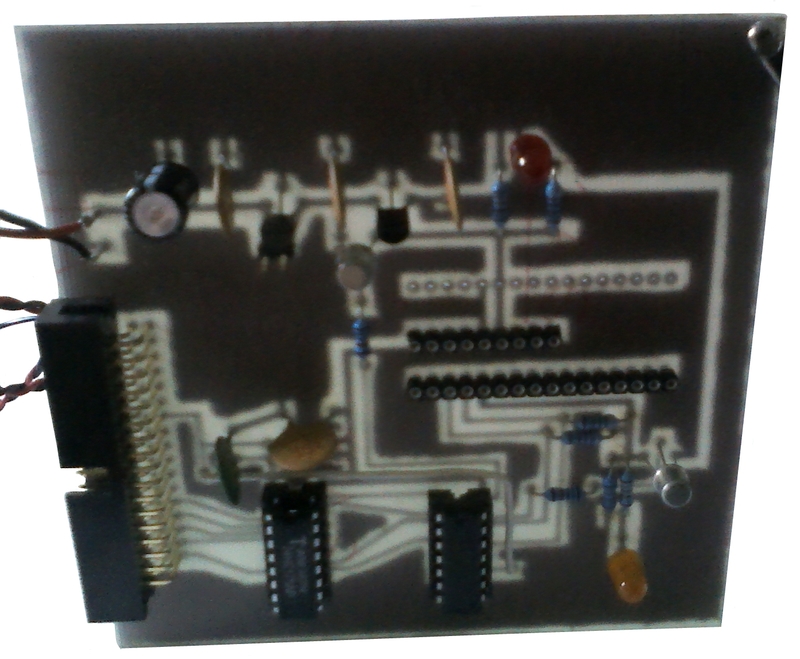 . . . .
D2 – Turn on 5v supply. D3 – Turn on 12 volt programming voltage. 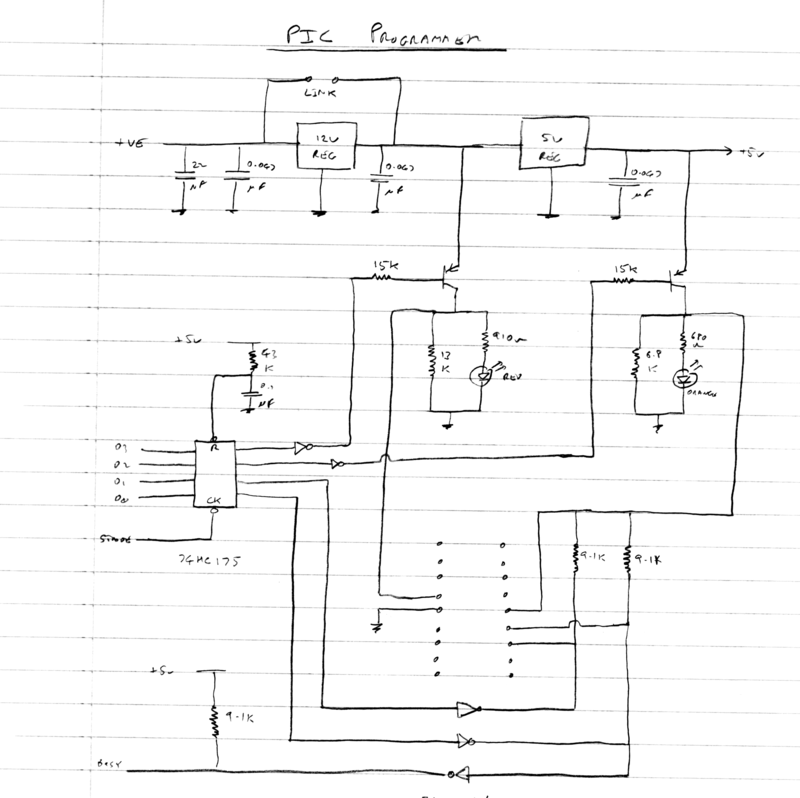 My circuit uses the printer strobe line to latch this data, which in hindsight is probably unnecessary. The CP/M software (BLOWPIC hexfile) that drives the programmer uses the Memotech CTC chip to time the programming pulses. 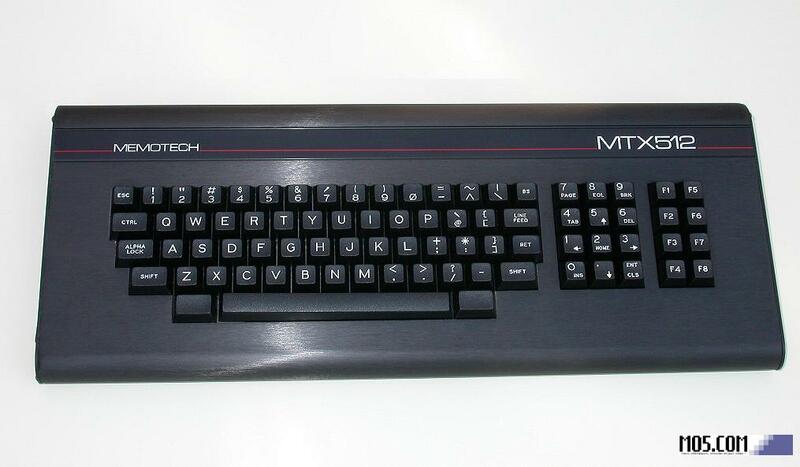 One word of caution: the programmer software assumes the hex file format generated by my PICASM software, which is not consistent with that produced by Microchip MPASM or the open source GPASM. The issue was caused by lack of readily available information on the format used at the time I developed the software. Since I now use GPASM and GPSIM on Linux to develop PIC software, I will fix that at some time, but have not yet got around to it." When the input of U1A is low, the output will drift up to +12v. When the input of U1D is low, the output is high impedance, only pulled high by R9. This means that, in this state, the PIC can readily drive the pin high or low when outputting data, which is then fed back to the Memotech via U1E and the printer BUSY line. The cable I use to connect either of my programmers to the Memotech is a ribbon cable, with IDC connectors attached opposite ways around at the two ends (pin 1 at one end attached to pin 26 at the other). This has the advantage of bringing the data lines onto the upper row of contacts on the right angle connector, where they are easier to connect to. LNK1 is inserted if running the unit off a regulated 12 volt supply, or removed if using an unregulated supply of 15 volts or greater." Bill has provided a sketch of the original design. 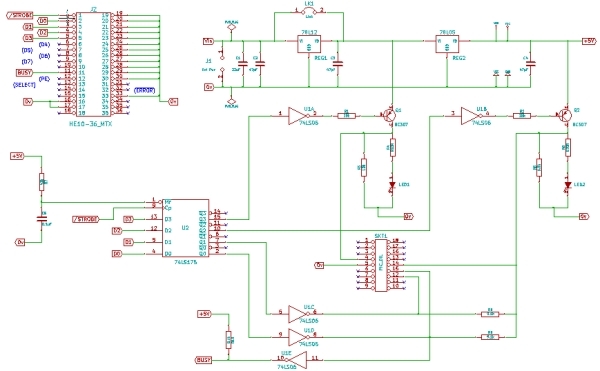 I have taken the sketch and drawn a schematic using KiCAD, note the KiCad schematic reorders the pins on the interface connector for a straight through cable between the MTX printer port and the programmer.